Angry Gran Run Miami The world tour of granny continues in Angry Gran Run Miami. 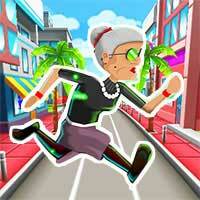 Run through the streets of Miami as you avoid surfers, cars, and many more obstacles. Will you be able to help Angry Gran see all of Miami and make it to the end?Enjoy it on Creetor.